A common phrase used is "Which do you want first? The good news or the bad news?" We gravitate toward being positive (mostly) here at Cardinal Couple...so we'll kick it off with good stuff this Monday morning. "I thought we played well. Our players really tried to do what we asked them to do as a staff. We were patient offensively and tried to run through some things and work on our execution." A 58-27 rebounding edge for USA. 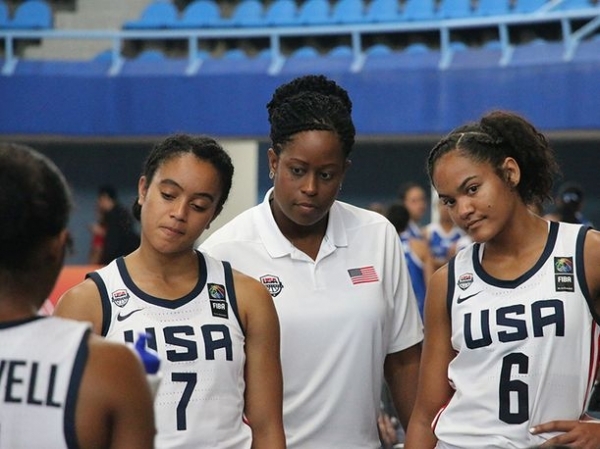 Maori Davenport set a USA U 18 single game record with six blocked shots to go with her six rebounds and nine points. UConn prospect Olivia Nelson-Odoba led the way with 14 points. Michigan standout Naz Hillmon-Baker added 13 points and also gathered seven grabs. Iowa State bound Ashley Joens contributed 12 in the win. ENGLAND DOWNS NORTH KOREA 3-1 in U 20 WOMEN'S SOCCER WORLD CUP ACTION. Mollie Rouse, who will be a sophomore on Louisville's women's soccer team this fall, has seem a lot of "U" team action for England over the past several years. That continues for her and her English squad won their first match in pool play yesterday in FIFA U 20 World Cup action over N. Korea 3-1. Mexico and Brazil are also in the Group. Pool play is in the Brittany region of France and continues through August 24th...so it looks like Mollie will miss the start of the 2018 season again down on the Belknap campus. A huge win for England, as North Korea was the defending title-holder. 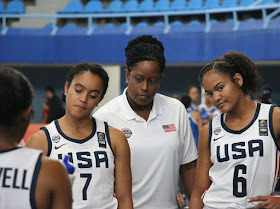 We hope Rouse picks up a lot of valuable experience in the 'Cup and can share it with her Louisville teammates when she comes back to the states. Louisville will miss her leadership and abilities on the Lynn Stadium pitch but Rouse will be back in plenty of time for the tough ACC schedule. Both bad and good news here in this segment. The underdog, kids from nowhere Irish Green Army marched all the way to the finals in 2018 Field Hockey World Cup action but ran into defending champion and buzz-saw in The Netherlands yesterday. Down 4-0 at the break, the Irish would have to settle for the "Silver" in a 6-0 loss. No shame at all, when the #16 seed makes it to the finals. As I found out a few years back, the Dutch Field Hockey exploits can be paralleled to the success of USA Basketball on the world stage. 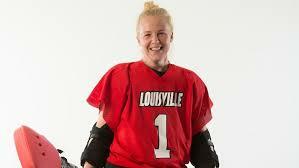 The good news is that Louisville's Ayeshia McFerran was named the tournament's Best Goalkeeper. She surrendered a mere three goals in the first five matches, came out on top in two shootouts and helped lead Ireland to their highest finish ever in World Cup Field Hockey competition. We look forward to Ayeshia's senior season here at UofL (although the rest of the ACC and Cardinal opponents might be muttering "There's that women again"). Another Cardinal proving it on the worldwide stage. During my time as an on-air personality at WCHQ 100.9 FM, I've had the incredible and enjoyable opportunity to meet some great musicians, show hosts and people at the "Magnificent and majestic media mansion on Mellwood". Gavin Caster is one of those. 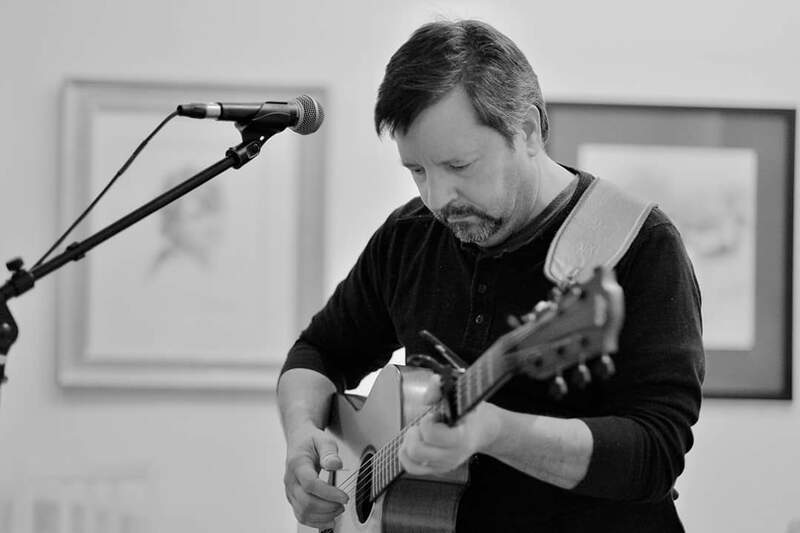 Last night at Stevie Ray's Blues Bar on Main Street in Louisville, a benefit was held for Gavin, who was recently diagnosed with prostate cancer. 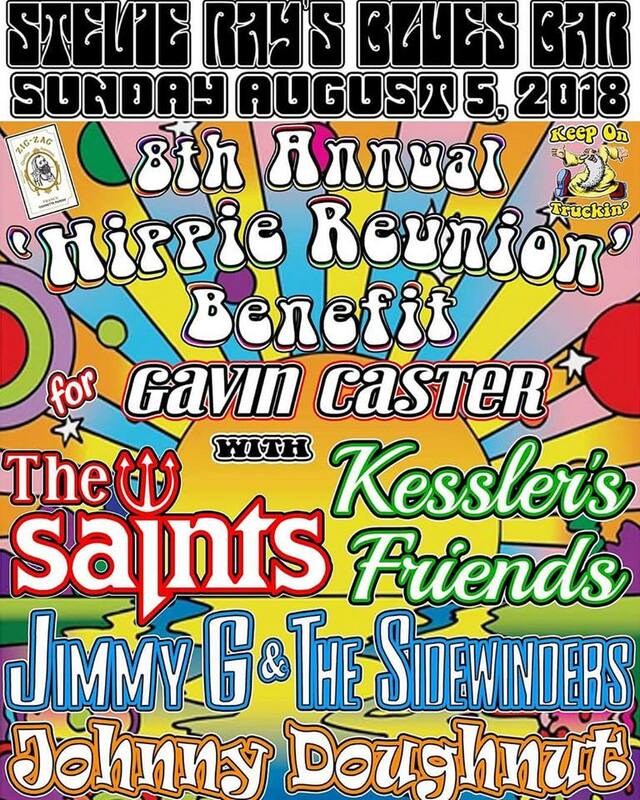 This Hippie Reunion, a yearly event designed to raise funds for a cause or individual is in its fourth year and proved to be a wonderful and touching night to help Gavin in his battle. The man has a set of pipes, no doubt. 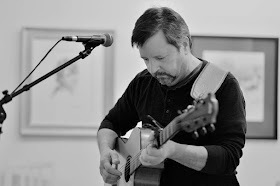 In addition to his powerful singing skills, Gavin also has a great show on WCHQ Monday nights. I had the chance to talk to Gavin for a bit last night and his spirit remains strong, his attitude incredibly positive and his sense of humor excellent. We were commenting on the many people (including him) dressed in the "Hippie garb" of late 60's and he got a big chuckle out of my comment "With all these Hippies in here, I'm keeping my eyes open for 'Narcs' and 'the man'. It was nice seeing this big turn-out for a guy who has done so much for the Louisville music community, WCHQ and it was neat that I ran into a few people that I hadn't seen since the 1970's. 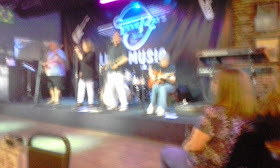 my lame atttempt to catch Kessler's Friends on stage last night. If you like the Beatles, Badfinger and other 60's and 70's performers, The Johnny Doughnut Experience is your band. An impressive set from the four-piece group last night. They have great three-part harmony...nailing complex Beatle songs perfectly. A couple of other bands were still yet to perform on the main stage and on the patio as we left. 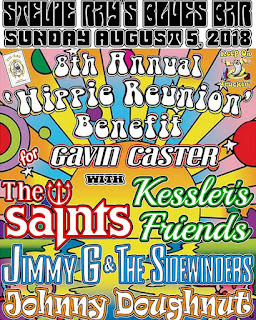 I'm sure everyone enjoyed the Saints and Jimmy G and the Sidewinders. It was starting to get a bit crowded when we departed, an impressive turn-out for our friend Gavin. Despite yesterday's unbearable heat, things were "cool" at Stevie Ray's Sunday night. Fight on, Gavin. You have a lot of friends that "got your back" and are in your corner. Keep it up USA! Tough to hear about Ireland and Ayeshia but they have nothing to hang their heads about. Good luck to Mollie and England as well. Sounds like you had a bit of fun Sunday night Paulie for a very good cause. Sorry to hear about Gavin Caster. Great that the Louisville musicians and community can come together for one in need. I like that song Mexico you linked! I think Firefall was an under-rated band back "in the day". Ireland was up against it for sure. Continued success to Walz and Mollie. My World Cup experience was getting a cup when I went to World of Beers. Cards WSOC better get Rouse back ASAP. Saw they were ranked 9th. of 14 in the ACC.